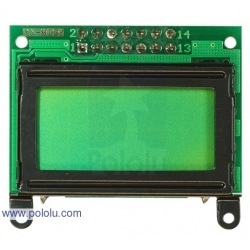 This 8x2 Character LCD - Black Bezel (Parallel Interface) is a compact 8 x 2 LCD is great for small microcontroller projects where you want more than just a blinking LED for feedback. This unit uses the standard HD44780 parallel interface and features a black bezel. This little 8-character, 2-line parallel liquid crystal display uses the common HD44780 interface, so sample interface code is widely available for a variety of microcontrollers. This is the smallest package we know of for this familiar interface.